Every now and then Roland has something unique to the market. Be it the rhythm pads, guitar effects pedals or the unique Handsonic HPD-20, the company is making waves in the music manufacturing industry. Now it brings a percussion instrument which can be played by your hands and even your fingertips, isn't that exciting? Yes it is and you will have a lot to gaze upon when you actually have the instrument in front of you. Well that is the story here; I don't need to write about the reliability of Roland products. Why people are so obsessed with iPhones? It is because of the quality and the performance of the software (OS) blended with equally performing hardware which is perhaps the best in the world. Same is the case with Roland products, the reliability and the overall quality of the products are such that you don't think of another brand when you need to buy a specific instrument. 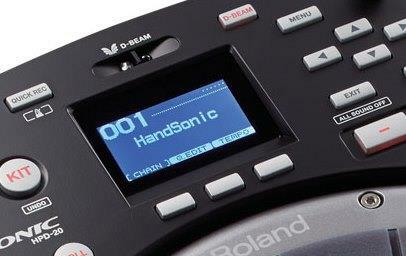 Now how that translates into the Handsonic HPD-20 is simply brilliant. The build quality, the pads, the switches, knobs, screen everything on the HPD-20 is what you expect from the best in the business. The most exciting feature about the instrument is the freedom you have with this amazing product. You can record your performance, overlay it with loops, give special effects to any kit in quick time during your performance, and connect it to any external device like your MacBook Pro or your Personal Computer, Put your own loops into the instrument using an USB Flash drive, and even control the sound and kit voices by just hovering your hand over the instrument. Don't believe me? D-Beam is the name which Roland gives it, where you can just hover your hand over the D- Beam and you can control any sound in the kit. This is just a short list, you can do even more. 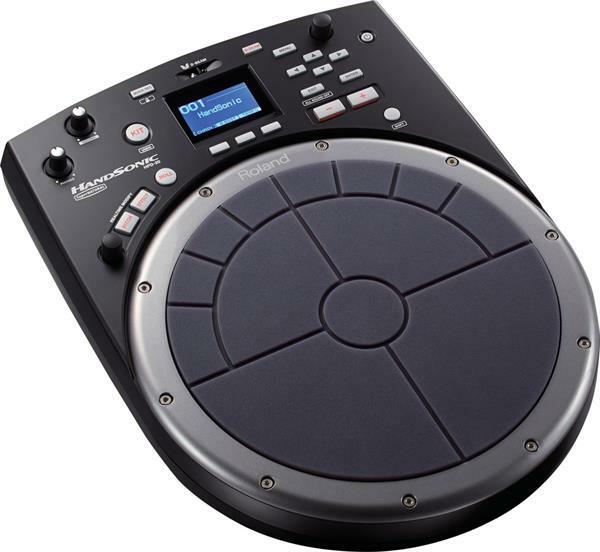 What is the main difference between other percussion pads and the Handsonic HPD-20? You can play it with your hands and fingers, from powerful shots using your palm, to subtle grooves using your fingertips. Such is the versatility of the instrument that you may take a little more time than usual to really get acquainted with the instrument and the adventures it is going to take you in your beautiful musical journey with this Roland Handsonic HPD-20. The design is brilliant considering the fact that it is an instrument to be played using our hands and not sticks. It is compact, lightweight, and appealing enough for any person around. A good look at the product will give you an indication of how compactly the instrument is built and what attention to detail Roland has given to it to make it one of the most exciting percussion pads around. The circular pad is divided into 13 sections and what is really exciting is you can assign different sound to all the 13 pads and play the way you like it. The screen and the buttons and the knobs are designed perfectly in the right slots for you to be in control while you are performing because everything on this compact design is easily accessible. The volume controls are to the left so that you can access them even when you are playing without affecting your performance much, if you are a right hander like me. The front panel where the ports for all the connectivity options are situated is carefully designed to accumulate every port in its place perfectly. The build quality as I mentioned earlier is superb. No issues whatsoever in the build quality department. All is well in this perfectly designed instrument. I would rate 4.9 stars out of 5 for design and build quality. Is it too much of a rating? Well that is how the product is. Roland has done a good job with making the user interface simple and intuitive experience. You have a screen were you can see the kit and sound information, below which you will notice different buttons which will help you to navigate through the instrument. It is quite simple and straightforward. You do not need to eat your brain too much to get to actually know the User Interface. For instance if you hit the menu button all the important functions and settings will flash in on the LCD screen and you can do what you want accordingly. You can assign different sounds for all the 13 pads on board and can even add different effects like Reverb and Delay all in a very simple manner. I would say if you have used any rhythm pads of Roland, especially the SPD-30 you will find it easier than a person using it for the first time. I personally liked the easy and intuitive User Interface of the instrument and same will be the case with you people out there when you actually come to know about the versatility of the instrument and the ease at which it can be accessed at the same time. I would rate it as best in its category. Play combination of sounds with more than 800 instrumental sounds and store 200 of the sets of assignments and recall them instantly while you perform. Control the sounds without touching the instrument using D-Beam. Edit sounds individually from the volume to the tonal character of each sound. Use effects to modify the sound while you perform, like adjusting the distortion to adding reverbs to produce your signature sound, all in real time. Add your own sounds to the already built-in sounds of the Handsonic HPD-20. Record and playback: Record your performance and export it as an audio file. Built in metronome: Helps in rhythm training and warming up before a performance. Works with your computer: Connect the Handsonic to your computer via USB and exchange audio and MIDI data with ease. As no stick is used in playing it is ideal for sound design and performance with your computer. Add expansion pads: Expand your system by adding a kick pad, footswitch or hi-hat control pedal, using your feet to play. 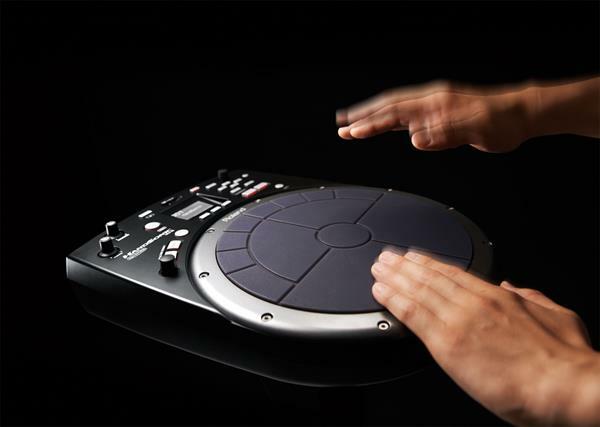 You can also add a bar pad or cymbal pad that you play using sticks, and play the Handsonic as a percussion set. These are some of the basic features of the Roland Handsonic HPD-20. Any electronic percussion instrument which you can play with your hands and fingertips is always going to be good. Here Roland scores big with the option of using our hands for playing. What is unique is that the pads recognise the velocity of your hands, to the stress level you apply when you play, producing different sounds. The realistic sounds and the huge gallery of sounds and the effects which you can give to your performance, and the loops with which you can overlay your performance with, is all brilliant in its own right. The feedback of the pads to your playing is more than extra-ordinary. For instance you are playing a bongo sound, if you hold on the pad with one hand and play with the other you get the same feel and sound which you will get the original instrument. Such is the feel and feedback of the realistic sound engine of the Handsonic HPD-20. Great sound engine, unthinkably versatile, simple and intuitive User Interface, D-Beam feature helps controlling the sounds without touching the instrument, good build quality, Pad expansion availability, USB flash drive connectivity, pads sense velocity as well as stress, huge number of sounds and effects. The playing pads could have been a bit bigger. The final verdict from me is, this is an amazing instrument with versatility were you can control the sounds without even touching the instrument. The sound engine is superb, build quality is perfect, and the User Interface simple and intuitive for anyone to get it quickly. Record and overlay your performance with loops, and share it on your PC all in real time. This definitely is an amazing instrument for percussionists craving for real innovations in their performances.